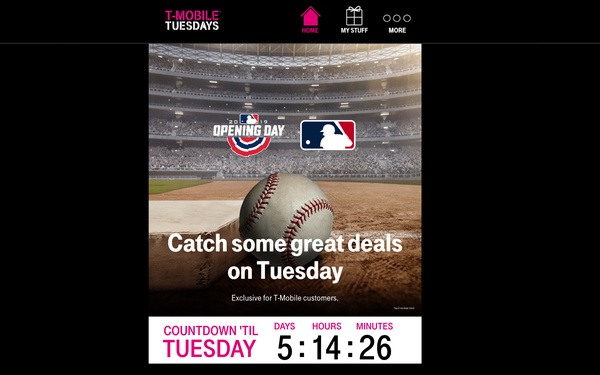 T-Mobile, possibly the most giveaway-happy of the wireless carriers, is again offering a free year’s subscription of MLB.TV and MLB At Bat via a T-Mobile app. That’s a $119 freebie to new and existing customers. Theso-called UnCarrier has offered the same deal for the last three years, with T-Mobile users streaming nearly three million hours of MLB games last year, twice as much as the year before, says John Legere, T-Mobile’s CEO and pitchman. After seven years at bat, T-Mobile just signed on for four more years as MLB’s official wireless carrier. This year the deal comes with a particularly showy promotional piece: The carrier is once again title sponsor of the T-Mobile Home Run Derby during All-Star Week in Cleveland, a popular fan event -- but one that's likely to be even more so for players. That’s because the winning player now gets $1 million, which on MLB monetary scale is nice walking-around money compared to the $125,000 in chump change awarded last year. Thecarrier also becomes the official wireless sponsor of Little League International. Just a few days ago MLB and the Little League organization expanded their joint sponsorship agreement to promote both leagues. (Geico is the official sponsor of the Little League Classic). Major League and Little League are somewhat in the same boat -- worried about a generation of kids who are indoor creatures and not playing sports as much.